Hard-earned life lessons we can steal from the "Big Three." 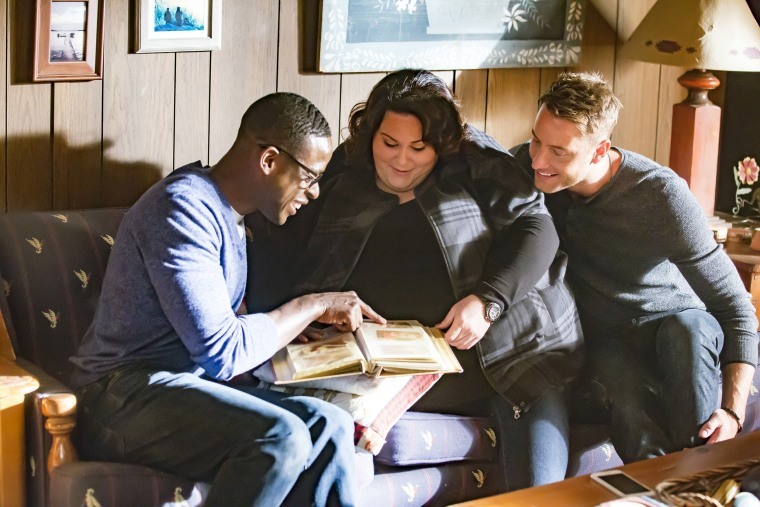 There are plenty of reasons why NBC's Emmy Award-winning "This Is Us" has become such a hit. One of the biggest draws arguably being that the cast of characters are so authentic, sitting through an episode feels like a therapy session (without the price tag). Watching each character navigate extremely relatable experiences with family, friends and significant others, it's easy to see a little bit of ourselves in each one of them. The show follows the Pearson family across the decades: Through flashbacks we see Jack and Rebecca’s (played by Milo Ventimiglia and Mandy Moore) lives as young parents, and in the present day story-line, we see who their now 37-year-old triplets Kevin, Randall and Kate, also known as the "Big Three," have grown up to be. The plot covers everything from anxiety to cancer to reconnecting with estranged parents. Suffice it to say, there’s a lesson or two to be gleaned from the show. Jealousy and competitiveness between siblings isn't just kid stuff. Throughout season one, the rivalry between Kevin and Randall continues to play out even into their adult lives. In childhood, Kevin expresses this by bullying Randall. In adulthood, he's constantly seeking Randall's approval. To make sure that all members of a family feel valued and important, set aside one-on-one time with each child. For parents facing this challenge, Amy Cooper Hakim, Ph.D. suggests setting aside dedicated time with each child to help eliminate any feelings of favoritism. "Because Jack and Rebecca tried so desperately to make Randall fit in and feel loved, they unintentionally paid less attention to Kevin," she says. "Kevin then had animosity toward Randall and his parents. In order to make sure that all members of a family feel valued and important, it is a great idea to set aside one-on-one time with each child. Focus on his or her respective strengths, needs and uniqueness." While they may seem innocent, comments like "Why can't you be more like your sister or brother?" can end up doing more harm than good. "Make sure that your time with that child is focused solely on him or her, and strive to avoid comparing your children to one another, as this exacerbates sibling rivalry," says Hakim. As for adult sibling rivalry, Hakim says the key to easing competitive tension is to work on resisting the temptation to participate. "The easiest way to stop sibling rivalry in its tracks is not to compete," she says. "If your sibling pressures you to compare successes, simply state, 'This is not a competition. We can both be successful in our own way.' If your sibling does not drop the issue, then say, 'I am proud of you for your successes, and I hope that you are proud of me for mine.'" If you're the sibling who feels jealous, get to the bottom of why. "Ask yourself why you are jealous and remind yourself that everyone has their own strengths and areas of weakness," says Hakim. "Focus on being happy with yourself. Remember that there is no need to compare yourself to others." Anyone who has struggled to feel comfortable in their own skin can relate to Kate's journey throughout season one. We see it unfold from childhood through adulthood, from painful experiences with bullies to the constant comparison to her mother's slim figure and, eventually, how her weight impacts her romantic relationship with her boyfriend Toby. While both Rebecca and Jack did their best to make sure Kate felt loved unconditionally, the show highlights how even simple observations in early adolescence can impact self-esteem. "A striking moment was when Kate noticed her mother’s smaller size when looking at the label in Rebecca’s shirt," says Hakim. "It can be quite difficult for parents of obese children to learn what to say (and when to say it) so as to best support their children and encourage a healthy lifestyle." Be mindful of the words you're using when speaking with your child about food. The word 'diet' should not come up in conversation. Hakim says that getting a third party involved can be immensely helpful to parents who want to help their children make healthier choices. "It’s ideal for a parent to enlist the help of a nutritionist or pediatrician, so as to create a healthy lifestyle family plan," she says. Also, practice what you preach. "It is important for parents to set the tone for healthy eating and healthy living. Children mirror what they see their parents say and do, so parents should model the way." Also, be mindful of the words you're using when speaking with your child about food. "The word 'diet' should not come up in conversation," says Hakim. "Rather, congratulate the child on making a 'healthy choice' when it comes to fueling their body with nutrients or exercising their muscles." Although Toby and Kate meet at a weight loss support group, Hakim says it's essential to understand that the experience is different for each person — even when both partners are obese. "There are different physical, emotional and medical reasons why an individual may be overweight," she says. "Openly communicate with your partner to learn any trigger words or actions, and be respectful of your respective journeys. Also, make sure that you clearly explain that your relationship is deeper than physical looks or struggles." Giving your partner that support isn't always easy, so it's important to be upfront about what you need — and to speak up when your needs aren't being met. "Toby initially respected Kate’s need to go to the overnight program by herself, as this was a struggle that she needed to conquer on her own," says Hakim. "But, he grew jealous and was unable to give her that freedom. This lack of clear communication and respect for one another impacted their relationship." Stalking the exes of your significant other is a fairly new problem thanks to the digital age. But for everyone who's gone down a similar rabbit hole of cyber-stalking when dating someone new, watching Kate's curiosity about Toby's ex-wife get the best of her is all too familiar. At the beginning of a relationship, it is appropriate (and expected) to ask pointed questions about past relationships. While Kate clearly crossed many lines here (pretending to apply for a job at your boyfriend's ex-wife's boutique being icing on the cake), Hakim says finding out information about a partner's ex the old fashioned way — by having an open and honest conversation — is more than fair game. "At the beginning of a relationship, it is appropriate (and expected) to ask pointed questions about past relationships," she says. "Since you're building trust, it is common to ask questions — and to hear answers that you may not like. Be frank about your 'need to know' information to the degree that makes you comfortable. Recognize that your new partner may not be comfortable sharing that information with you. If the information is critical for you to know, and if not knowing it will negatively impact your relationship, then say so." And if that still doesn't satisfy your urge to take a peek on social media, Hakim says to impose limits on yourself when doing so. "It’s normal to be curious about the way that the ex looks, etc.," she says, "but don’t reach out to the ex or attempt to talk to or stalk him or her. This is unhealthy behavior that will upset your new relationship and destroy the trust that you are building." For most of season one, we know Kevin to be a hopeless, yet ill-advised romantic, and we get the impression that most of his relationships are likely as short and fleeting as the ones we see with his former flames, Sloane and Olivia. That is, until he knocks on the door of his ex-wife, Sophie. Getting back together with an ex is all kinds of complicated — as we saw with Kevin and Sophie's attempt to do so. If you've ended a relationship that you're considering rekindling, Hakim says to examine the reasons why it ended. "Sometimes, we may rush too quickly and end a solid relationship before giving it the chance to be successful," she says. "If you feel that you both made a huge mistake breaking up, and you are considering getting back together with an ex, a number of stars need to align. First, you both need to be available and not in another relationship. Second, you both must be willing to give it another try. Third, you both must be prepared to work through the issues that caused the breakup to begin with. We cannot change our (ex) partner, but we can change the way that we react to situations." Also, be willing to do the work that you didn't do the first time around. "If you are serious about getting back together, consider attending couples counseling to go over the key issues that drove you apart the first time," says Hakim. "Understand important triggers and gain the tools to communicate more effectively during the new honeymoon phase and future times of inevitable conflict." From the moment we're made aware of Rebecca's remarriage to Miguel, her deceased husband's best friend, it's abundantly clear that Kevin is not okay with it. While we still don't know how the two got together or how long it's been going on for (though hopefully season two will shed some light here), it's true that a parent's remarriage can be hard on children regardless of how old they are when it happens. "It can be especially difficult for all of the players here," says Hakim. "As a parent, it is vital to recognize the impact of your choices on your children. Perhaps you are ready to move on, but your child is not yet comfortable with the idea." We're not sure if this is how Rebecca went about it with Kevin, but Hakim says step one should be to talk with your child before introducing your new partner into their lives. "Sometimes, having a grown-up dialogue is a good start," she says. Most likely, the child may resent the new spouse and wish that his parent were still alive. At the same time, the child is likely to want his living parent to be happy, too." If you're marrying someone with children, Hakim says one way to help form a relationship with them is to look for common ground. "When Rebecca’s second husband helped Kevin with his personal situation, that relationship improved," she says. "As a child [of any age], it’s important to state to your parent that you want him/her to be happy. Unless you see a serious issue with the new relationship, try to embrace it. And, if you can’t embrace it, make sure to tell your parent why and to emphasize that it does not mean that you love your parent any less." A better example of how to blend families successfully happens when Randall's birth father, William, comes into the picture — leaving Beth, Randall's wife, to explain to their two young kids what's happening. "Once Randall decided to pursue a relationship with William, Beth encouraged this and even housed and cared for William in his final days," says Hakim. "She encouraged a relationship with William and his grandchildren, and emphasized the need for creating and marking these memories." We should never lie to our children, but, at the same time, we should also use care to only share necessary, age-appropriate information with them. Understandably, introducing a stepparent or in William's case, a grandparent, into the lives of your children mid-adolescence can be confusing. "We should never lie to our children," says Hakim, "but, at the same time, we should also use care to only share necessary, age-appropriate information with them. So, if a dad’s birth parent comes into the picture, it is appropriate to introduce him as a special part of the dad’s life. Depending on the children’s ages, they may not question the relationship further. If they do, then determine a clear response that is succinct, like, 'This is William. I only recently met him, but am always happy to spend time with important people in my life. And, I know that you will enjoy getting to know him, too.'" William's entrance into Randall's life becomes even more complicated when he learns his birth father is dying from cancer. In Beth's case, determining her place in the process and how to be most helpful proved even more challenging — but a lot can be learned from how she handled it. "Beth gave William his medicine and took care of him while Randall was working and dealing with emotional issues," says Hakim. "This is a great example of selfless acts that spouses do for one another, and it is one for which Randall will be forever grateful. Even though she wasn’t thrilled with the idea, she did not hold Randall back from taking William on a road trip before his death. This was an important gift that William gave to his son, because he introduced Randall to his extended family. This helped Randall to establish those much-needed roots that he longed for." Beth and Randall also had to break the news to their daughters so soon after introducing William into their lives. But they did so in a way that was honest and age appropriate, allowing each daughter to honor his memory in their own way. "Terminal illnesses impact all members of the family, and it's is always important to tell the truth," says Hakim. "As a parent, do not fabricate information or cover up details about a loved one’s failing health. It's appropriate to share that a loved one is terminally ill, especially if the likelihood of death is near." Explaining this with metaphors the way that Beth did is one way to deliver the news. "Consider using an example about a toy that stops working or plant that dies to explain what to expect," says Hakim. "Share that you don’t have all of the answers and share that it is normal to feel sad. Also, note that it is common for children to wonder if others in their life will pass away, too. Be prepared to comfort them and to answer such questions."